Looking for the perfect souvenir to mark Men's Health Week? Half Moon Bay has joined forces with the car publisher Haynes to produce a special keyring to raise awareness for the Men's Health Forum. The novelty gift has a serious message, giving practical medical advice in an understandable way about cancer. In fact the message couldn't be simpler: check your nuts. Trading on men's love of cars, the spanner keyring explains how to keep fit and healthy with regular check-ups, much as you would a car. 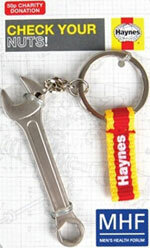 Haynes will donate 50 pence from the sale of every keyring to the Men's Health Forum. The RRP is £4.50. The key rings will be launched on 11 June.